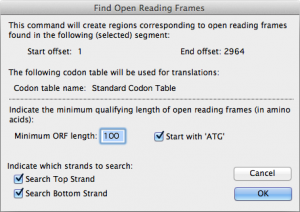 One analytical tool included in GCK is to automatically find open reading frames. Start GCK and open the construct file you created in the last tutorial, construct#2 . If you do not have this file, you can start with construct#2 from the tutorial files folder provided. You will finish annotating this construct in this tutorial and learn how to define open reading frames (ORFs). First, choose Construct > Display > Show Construct Title which will place the title of the construct and the length of the construct into the center of the window. Now choose Construct > Features > Find Open Reading Frames… . You will see the dialog shown in Figure 2.11. This dialog gives you complete information about how the program will look for ORFs. The minimum ORF length text field tells the program to only display those ORFs containing 100 or more amino acids. You can select the codon table to be used and specify whether to search one or both strands of DNA. If you are looking for ORFs in exons you might want to turn off the Start at ‘ATG’ check box – the program will then find any open reading frame (not just those starting with ATG). After you’ve adjusted the dialog to look like the one shown here, press the OK button to find the ORFs. After running the ORF search you will see two new objects in the construct window: arrows representing the two different ORFs found by this search, as shown in Figure 2.12. Both ORFs are highlighted. These ORFs represent regions of interest , or regions . In addition to site markers and DNA segments, regions are a third kind of object that can appear in the construct window. Regions can be formatted using the Format > Regions > submenu. Click somewhere in the window to deselect the regions just created. Now click once on the region on the right side that overlaps the polycloning site. Now choose Construct > Get Info… to bring up Figure 2.13. This dialog contains information about the selected region. You can change the direction of the region by clicking the Top Strand or Bottom Strand radio buttons. Changing the numbers in the First Nucleotide or Last Nucleotide box will change the length of the region. The Protein Sequence check box determines if the region is to be translated or not when viewed as an actual sequence (see Tutorial 4: Viewing the Construct as a Sequence for more information). This region is the beta-galactosidase region, so type “beta-galactosidase” into the Region Name text box. You can also enter comments into the Region Comments text box. Both the name and the comments can be searched by GCK later (Tutorial 8: Finding Comments and File Searching). In this case it might be reasonable to enter some comments about this vector and how the polycloning site disrupts the β -gal coding region. Click OK to close this dialog box. With the region still selected, choose Format > Regions > Show Region Names . This will display the region name in the construct window. You can select this name and alter the appearance of the text by using appropriate items under the Format menu. The region name text can be dragged around the construct window. When the region name text is selected, it is highlighted along with the region itself, making it clear which region is connected with the text. Now select the left region by clicking on it once with the mouse. Choose Construct > Get Info… . Change the name of this region to “ampicillin resistance” and put in comments indicating that the gene product is “beta-lactamase”. Click OK . Note that when you have a region selected, you have access to many items in the Format menu. This will allow you to change the appearance of the arrow in the construct and even change directions by using the Format > Lines… menu. This would be equivalent to changing the protein direction in Figure 2.13. If working with a ‘Trial Version’ or the ‘Full Version’ of the application, choose File > Save As… , name the file myconstruct#3 , and save it in your own folder – please do not replace the tutorial files provided because others might want to use them later. You will need it again in the next tutorial. You can quit now, or continue on to Tutorial 4: Viewing the Construct as a Sequence. If you plan on continuing, you can leave the file you just created, construct#3 , open. If not, close this file. This entry was posted in gene construction kit tutorials and tagged Gene Construction Kit, Gene Construction Kit Tutorials, Identify DNA Coding Region, Open Reading Frame, ORF, Translate DNA, Tutorials. Bookmark the permalink. Post a comment or leave a trackback: Trackback URL.